A Commission type does not have any value or percentage associated, it is purely for grouping products of the same commission level together. If all of your products have the same commission level you will only need to create one Commission type. For the purposes of this example we will create two Commission types: "Standard commission" and "High commission", the latter of which we will use for some products that should have an extra incentive attached to a sale. Log into TourCMS then go to Configuration & setup then Commission types. Enter each commission level in turn using the "CREATE A NEW COMMISSION TYPE" form. As you can see in the screenshot below we don't have any products grouped in either type as both the "Options" and "Tours" columns are showing 0. Let's move onto that now.. Under the Money tab select the Commission type and save your changes. Any products without a Commission type will be considered non-commissionable. You can change the commission type of a product at any time, this change will only affect new bookings. Each Commission scheme defines the amount of commission an Agent will receive for products of each Commission type. If all of your Agents receive the same amount of commission then you will only need one Commission scheme. For the purposes of this example we will presume that the majority of our Agents receive a standard commission percentage, with a select few "preferred agents" receiving a few percent extra. Use the CREATE A NEW COMMISSION SCHEME form to create your Commission schemes. 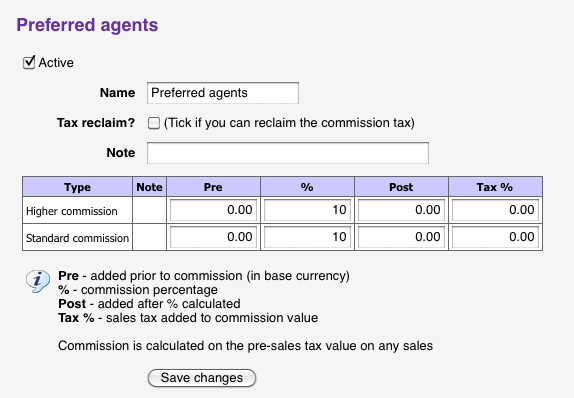 For our exampe we have two: "Most agents" and "Preferred agents"
Once you have entered your values click "Save changes"
All that remains now is to edit our Agents to configure which Commission scheme they come under. 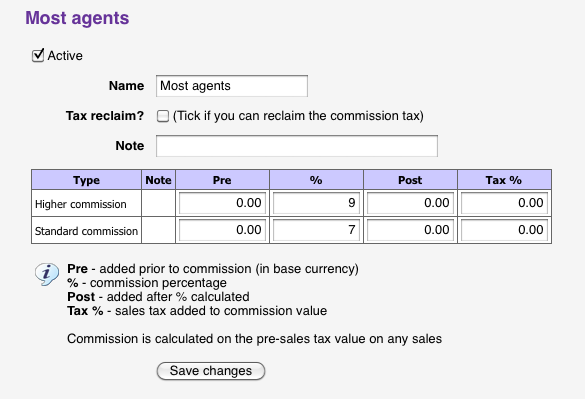 From the TourCMS Homepage click "Agents"
Any agent who does not have a Commission scheme set will not have any commission applied to their bookings automatically. You can edit the values in a Commission scheme at any time, you can also edit an Agent to move them onto a different Commission scheme. Both of these changes will only affect new bookings. If the total sale price is 100 GBP, the deposit is set to 20%, the commission is 10% then the deposit will be 20% of the 100 GBP. That's really all that's required, your new bookings should now have the correct commission amounts calculated automatically. You can also edit the commission on individual bookings by going into the booking then clicking on the EDIT / RECALCULATE link under Marketing tab.